I can describe the beautiful image that built in my mind as I read John Dewey’s book “Experience and Nature” by describing a vision of reality as currents in the ocean of mind. Think of mind as an ocean and within that ocean there are currents. Now imagine that there are objects floating on the surface of the ocean. The objects represent people and the direction that the objects will float in over the surface of the ocean will be determined by which current they get caught in. The objects get swept into one current and get carried along for a while in one direction. Then another current picks them up and sweeps them off in a different direction. You might see different objects get swept along by different currents in different directions and as the currents change direction the movement of the objects also changes direction. You can’t really see an ocean current. (Let’s for the moment not count waves and ripples and assume the currents are very slow and not really visible.) When you see the patterns that get traced out by the objects floating on the surface of the water you know the currents are there. This is very similar to the magnetic field that surrounds a magnet. You can’t see a magnetic field, but if you pour out iron filings around the magnet the iron filings will arrange themselves along the lines of force of the magnetic field. The movement of the iron filings allows you to “see” the magnetic field. As I began to describe in my last few posts, the currents of mind take the form of ideas (mental objects) that have meaning associated with them. Ideas act as signs or pointers that direct us towards certain possible outcomes. The idea “job” points to the possibility of working for a living. The idea “responsibility” might also point in the same direction and reinforce the idea of “job.” The ideas that we hold are all pointers, they are currents in the ocean of mind. We all know that if you hold onto an idea that idea can easily sweep you up and lead you to actions and possible futures. I believe that John Dewey saw ideas as currents in mind that carry us in different directions. In this he is very much following in the footsteps of one of his mentors and friends William James. Look at all of the ideas that are always swimming around in your head (I am using the phrase figuratively not literally) and notice how they have an energy to them that point towards and even compel you towards different possible actions that will lead to different possible futures. If you were not aware of any ideas at all, what would happen to you? How would you behave? Allow yourself to get a sense of the fluid liquid ocean of ideas that we are all swimming in. Get a sense of how it is sweeping you along, pushing you in this direction, carrying you in that one. We are like objects floating on an ocean of ideas, but we are not passive. We create the ideas and adjust the ideas. We change our minds; we have some ideas that tell us to do one thing, some ideas that tell us to do the opposite and still other ideas that decide between the two. We float on the ocean currents and get swept away by them and we create and alter the currents in the ocean that we float on. By changing our ideas, we can change the direction that our energy and our actions will take us in. Changing our ideas will change the future. Could we say that the currents or fields hinted at here are the subtle energy fields that correspond to mind, in the same way that activities of the brain correspond to mental activities, but that mind itself does not have location, and cannot be seen or even conceived of in the third-person, but only as subjective interiority itself? Good stuff, but lets stop short of “the law of attraction” ok? It’s interesting how deeply metaphorical this language is. Julian Jaynes ( http://www.julianjaynes.org/) whose evolutionary account of consciousness I mentioned in an earlier comment, argued that consciousness itself is a metaphor, and that we speak about it as though it were real while actually referring to an enormous number of metaphors based on external, physical reality. If you strip away our metaphorical language, it’s hard to identify anything specific that consciousness might be separate from our behavior in relation to the world. What can we say about an epistemology that is based on metaphor? Great post!!! When I began reading this post the first thing I experienced was an overwhelming sense of hopelessness. We are driven by a current… We are at the mercy of the waves and the ocean’s will. The thing is that many of us are not even aware of it; we are being led by ancestral ways of being, by old currents of conditioning, thinking that that is what we have chosen as our life or path, completely unconscious of that we were born inside that current of though and that we never were able to consciously choose anything in our lives. First of all we have to be aware of that we are actually in a current; second we have to be willing to acknowledge it and not to deny the fact that we are not mastering our life. Them it will take a really brave individual to actually make the effort to create a new one, one that we consciously choose and to navigate our lives from that new perspective, a perspective that can embrace the new current, all the other ones, the whole ocean and the context where everything arises. Even I know spiritual teacher Andrew Cohen and Jeff for a really long time and appreciate of all. 1. Willing to acknowledge THAT. ( Side effect: such relief from the burden of I have to create the heaven, torment of own hypocrisy). 2. Exitement,Groovy! !about the glimpse of I can choose and the possibility of most meaningful life we can live. 3. Brave, Guts to create New. (Change and I admit not have confidence regarding own integrity of commitment of change and create the reality). 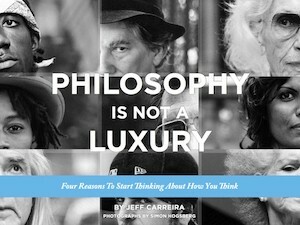 Thank you Jeff ,looking forward to see your blog to keep analyze the philosophy in the sight of pragmatic. I got confused whether the current is associated with the mind, or with the flow of ideas, or whether the two are identified. There is also the will coming up somewhere [ which to me is not the mind neither the ideas]. I would start like you with the simple observation that when we are in meditations, thoughts come and go like in a flow and this flow seems to come from nowhere. now take the opposite situation where I ma sitting ( like today by a warm Brazilian evening) at a table outside, with a physics project in front of me. Now the interaction with the flow of thoughts is radically different. I am completely focused, I choose some thoughts, some images some ideas, and choose to discard others. Little by little some coherence emerges to get to the solution of the problem in front of me. It is what I call “ directed thinking”, just the ability of human mind to build rationally on ideas. This I would say is completely active and depending on training and volition. No way I get caught in the flow of ideas if I don’t decide to. Moreover when one is so focused an the problem is tough, the perception of the flow of ideas suddenly drops and we reach a strange vacuity, [ which many of us experienced as the trauma of the “white page” at an entrance exam to university for example] and which is for me very close to a spiritual experience. I mean it is real vacuity… that is experienced here. So just to convey here that there is much much more than the flow of thoughts which takes us here or there. Thoughts are not just passive images or concept which indicate some kind of direction to the mind. Thoughts interact with each other, they can be assembled in logical and directed thinking, and my personal spiritual conviction is that they can almost look “alive” [ by “alive” I mean in-habitated by this same Organic Force to Evolve which makes our human lives and the one of nature]. For the alive objects that Thoughts are, our mind is the organic support. This is interesting. When I studied physics as an undergraduate I used to observe myself solving physics problems. I once realized that I acctually had not idea where the solution was coming from. I saw that what I was doing was directing my attention on different throughts or objects (like diagrams, or formulas written on a page) and then periodically in a moment of inspiration a new thought or a new connection would appear. That might seem to take me one step closer to the solution so I would keep my attention on that new insight and the thoughts and objects that seemed to lead to it. Until another insight would pop out of nowhere and eventually I would realize that the problem was solved. So my expereince was that even in directing my attention I could only direct my attention over what I already knew in the hope that somehow that would stimulate something novel to appear. Does that match your expereince? It would seem that there are those individuals who are drawn to solving problems and really creative souls will dredge up multiple solutions, like an inner brainstorm to come up with them till a satisfactory one comes up. Good researchers are those who will folow up, if the situations allow, to prove their ideas are actually solutions. We award Nobel and other prizes for significant solutions that benefit humanity largely. The Ocean of the Mind is maybe a metaphor to speak of endless possibilities. As I am wont to point out, everything has an up- and a downside. The upside of the Ocean of the Mind would offer endless possibilities for humankind’s challenges. The downside is that monkey-mind that is difficult to tame and focus. Effective brainstorming allows the monkey-mind to present unfeterred all the ideas. Then the disciplined mind edits all the ideas to come up with the ones that offer the most promise and sets out to prove their efficaciousness. Is there the possiblity to allow for spellchecks post-posting?